In the market for a new flat screen TV? Instead of purchasing an expensive entertainment center, it is often easier and cost effective to mount it on the wall. Wall mounting allows you to save valuable space in your home by putting the TV anywhere in the room. Further, some wall mounts have swivels that allow you to adjust the viewing angle, giving you more flexibility. If you have decided to mount your TV, you may be tempted to do it yourself. But below are the reasons why you should think of hiring a professional. If you are not careful, you risk doing damage that could necessitate expensive repairs. You run the risk of structural damage to your house particularly if your wall has metal studs or is made of plaster. You also risk breaking your TV, which defeats the purpose of installing the mount in the first place. If you are not someone who does carpentry on a regular basis, you may not know how to use all the equipment required to install the TV. Wall mounting requires quite a few tools, including a power drill, socket wrench, stud sensor, level, padded blanket and measuring tape. Even if you do have the necessary equipment, if you are not sure how to use it, you could end up damaging your wall or TV. 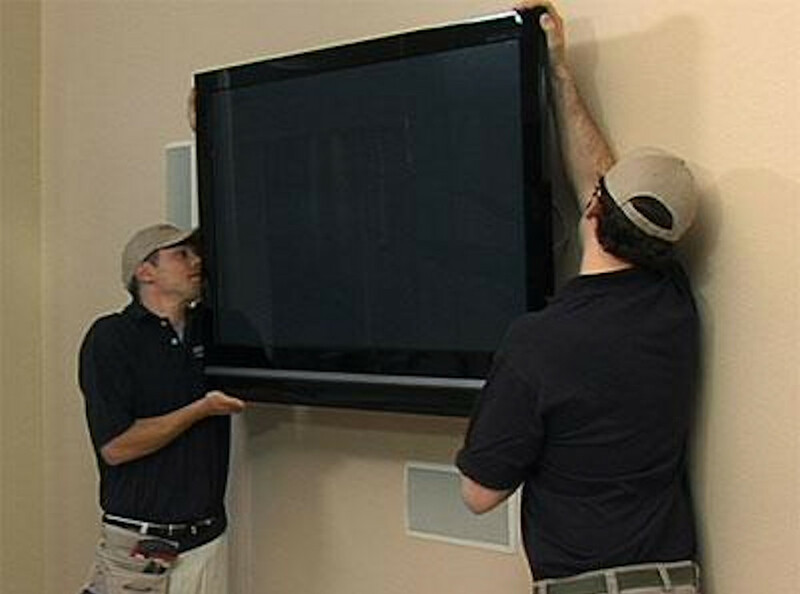 In order to properly install the mount, you will have to lift the TV. This is not a job for only one person. To avoid dropping the TV and potentially hurting yourself, it is best to hire a pro. 4. Where are you going to put your cable box, disc player and surround sound equipment? Professionals are equipped to manage the many wires and connections auxillary equipment use to connect with your television in order to enjoy surround sound, streaming and ability to play 4k Blu Ray movie discs through your wall mounted television. Installing a wall mount is not a matter of simply reading instructions. A TV wall mount has a lot of advantages, but the last thing you want is broken TV caused by trying to cut corners. Calling a professional will result in a perfectly placed TV using proper weight rated materials, wires installed within the wall in no time at all.